Well, after the exciting launch of the new edition of Warhammer 40,000 at the weekend, there really could only be one game that would be featured on my game day blog today! This isn’t going to be any kind of exhaustive account of the game, but more some of my initial thoughts after getting the new starter set and having had a flick through the rules. 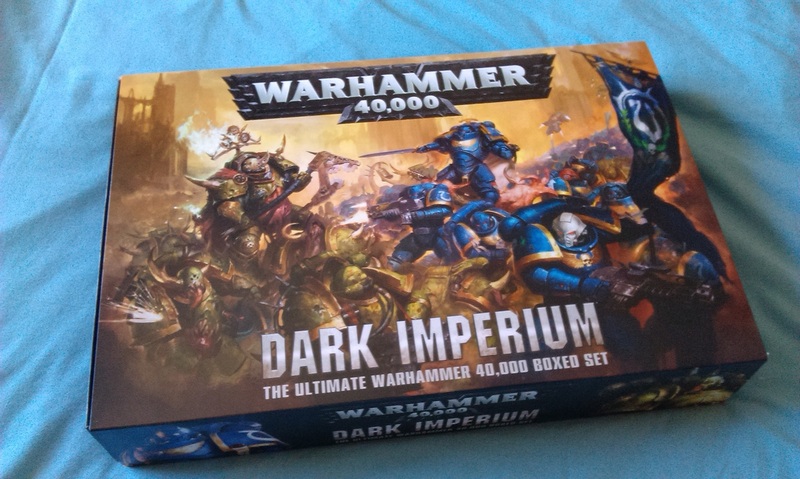 So let’s take a look inside the Dark Imperium! Warhammer 40,000 8th Edition is amazing. While I haven’t yet had a chance to field any of my armies in the new rules, I can still say that this is the most excited that I have ever been for this game in the last three years, and I’ve been fiddling with army lists and devouring rules, building and painting more miniatures, and generally basking in the glow of the new for a while now. 7th Edition confused and scared me, and given the fact that this is supposed to be a game that you’re supposed to play for fun, that’s just weird. By contrast, 8th Edition seems much more straightforward, while retaining a degree of depth. I had a total of three games played during 7th, so I’m not about to launch into a comparison of the two editions, but I may still make the odd comment. To begin, though, I think it’ll help to go over the phases of the game and see how the whole thing is structured. Next comes the Psychic Phase. Something that I usually don’t bother with, having my main army as Necrons and my second army as Dark Eldar, the Psychic Phase is nevertheless something that I really like the look of, and has been one of the reasons I’m so keen to get moving on my Genestealer Cults army! Things have been simplified, so that you now attempt to manifest a psychic power by rolling 2D6, and Deny the Witch just means roll 2D6 and beat the test result. Seems very straightforward, rather than gaining all those warp charge dice, and using some to do things with and all the rest of it. The Shooting Phase has changed insofar as units can split fire, and the roll to hit is now a target in the unit’s profile, for example 3+ for the Genestealer Primus, rather than having a Ballistics Skill value that is subtracted from 7 in order to find out what you need to roll. BS, indeed. There is still the nonsense about rolling again to see if you wound the target, comparing the strength value of the weapon to the toughness value of the model you’re shooting. It seems unnecessary to have to roll twice to see if a shot was fired at a unit, but at least there’s no longer the need to memorise a massive table of what you need to roll to actually wound somebody – now, there’s a very simple chart that does simplify this element a great deal. My main issue though is that this element is still in the game, to begin with! In real life, if I shoot you in the head, the odds are it will cause a wound, you know? Anyway… There are still Saves to be made, either armour saves or cover saves, and this involves another change, as weapons have modifiers to these saves on them now. I like this, as it makes a lot more sense to me. For example, going back to our Primus example, he has a Save of 5+. However, if you’re shooting at him with a Necron Immortal wielding a gauss blaster, those weapons have -2 Armour Penetration, meaning that the saving throw is made worse by 2. So that Primus needs to roll a 7 or more to avoid that wound, on a single D6. I don’t know if you’d ever use Immortals for that sort of attack, but the Primus does have five wounds, and could be the Genestealer Cults’ warlord, so it could be useful! After shooting comes the Charge Phase, where you can charge an enemy unit within 12″ by rolling 2D6 and moving, before which the enemy has the chance to fire Overwatch at you. This is an out-of-sequence shooting attack, where all shots hit on 6+ regardless of the previous Ballistics Skill business, to reflect the panic I suppose. Whereas previously this could be detrimental to your charge, as you had to remove casualties from the front, meaning you might not have enough models to get within melee distance, now the controlling player chooses where his casualties come from, so you can remove models from the back if you want. The Fight Phase has changed insofar as the charging unit will go first, now that Initiative has gone. I’ve talked about this before as well, how I liked Initiative and stuff, so I’m a bit gutted about that. Apart from that, though, it does still feel mechanically like 7th Edition. You charge, you pile in, then you slug it out with hand-to-hand weapons. This is pretty much the same as shooting before, though you use the Weapons Skill value to determine hits. I’m looking forward to seeing how my Necron Lychguard fare this time around, as the warscythes do look to be quite beastly in close combat – hitting on 3+, then wounding most often on 3+ also with a -4 AP and 2 wounds per hit, that looks awesome! As an example, a unit of five Lychguard would make ten attack rolls that hit a Genestealer Cults Chimera on 3+, they’d wound on 4+ because the strength and toughness are both 7, but due to the AP, the Chimera’s save would be 7+. It’s too early in the day to work out probability, but I’m sure it would be glorious! Interestingly, you don’t get the additional dice for charging – I guess getting to go first in combat is bonus enough! Finally, the Morale Phase checks to see how many models from a unit died that turn, and adds that number to a D6 roll. If the result is higher than the Leadership value of the unit, you remove models from that unit equal to the number of points higher you rolled. So if you roll a 5 and 4 models were slain from a unit of Neophyte Hybrids, their Leadership is 7 so you remove two more models from that unit. These are the core rules of the game now, so a lot of it has indeed been simplified. However, there is a strong element of Age of Sigmar in this game insofar as each datasheet for each unit contains unit-specific rules. While the core rules are therefore just 8 pages long, there are tons more rules in the place of the universal special rules that took up a chunk of the core rulebook previously. Sure, things like the unit types rules have been drastically simplified, and these changes are definitely for the better, as it makes it so much more straightforward to seeing just how a unit works. I’ve rambled about my difficulties in trying to find the rules for Triarch Praetorians previously, needing two different books and about four separate pages within those books just to figure out how the models work. None of that exists now, really. If you know the 8 pages of rules, all you need in front of you is your own datasheet for that unit, and away you go. I love the fact that the datasheets have everything you need to know, even down to the most common weapon loadout profiles. True, I’d have preferred to have seen every weapon on there for even greater ease, but I imagine some units might get quickly over-loaded. But these things are few and far between. In the main, if you want to know what a weapon on your model does, the rules are there on the same page as that model. The three ways to play thing, ported pretty much directly from Age of Sigmar, is also really cool as it allows the game to be more things to more people. If you like picking out an awesome element from the narrative and re-creating that, you can do that. If you want to have an equal points-level, you can do that as well. Points have been taken one step further, by having an overall “power” level for a unit, based on roughly 25-3o power for every 500 points. While initially it seemed that power levels were being decried as worthless, over the launch weekend it seems that pretty much everyone at my local stores were talking in terms of power rather than points. It seems to be a great way to quickly build a list and start playing, rather than spending an evening working out the exact cost of your army. Of course, if that’s your thing, then you can still do that. What’s even more interesting to me is the fact that there are 8 pages of core rules, the majority of this blog so far having gone over them, but there’s an additional Appendix that adds in a bunch more rules that you can add in to however you choose to play, meaning you really can make 8th Edition as complicated as you like. I think the rules overall are a great way to invest a lot of narrative into the game, and I’m really looking forward to getting some games in soon! As always with a new edition, we also get a new Starter Set for the game, which has previously come with all of the dice and templates that you need, in addition to a rulebook and lots of fantastic miniatures. 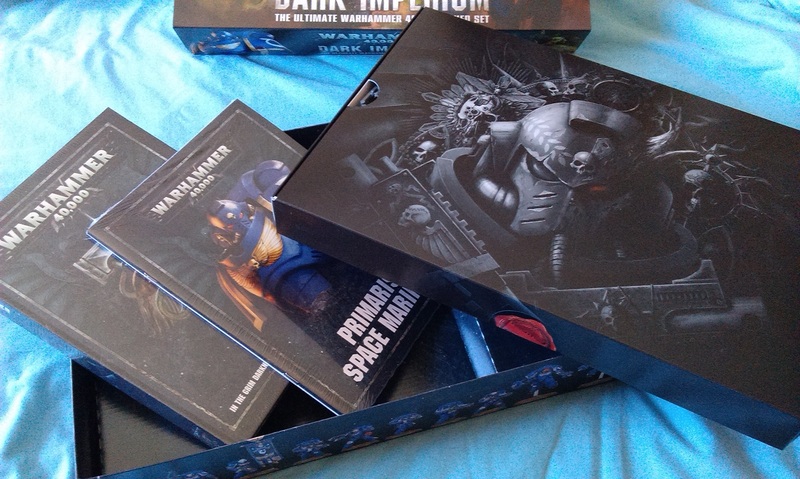 Well, this edition doesn’t use templates or special dice, but we do get the full hardback rulebook, along with some truly spectacular miniatures in the new Dark Imperium box! The factions included here are the Primaris Space Marines, and the Death Guard. So it’s a bit similar to the last box, Dark Vengeance, which featured loyalist vs Chaos space marines, but the miniatures here are really quite spectacular. I think the painting video where Duncan paints the Lord of Contagion really shows how incredible these new guys are! You get the full hardback core rules, which alone cost £35 and accounts for most of the weight of this thing, as well as short “codexes” for each of the factions that have some paint schemes, some fluff, and the datasheets (they even include the points values for them, if that’s something that interests you!) And of course, you get 53 beautiful (if disgusting, in the case of the Nurgle stuff) miniatures. £95 seems like a lot of money, don’t get me wrong, but it also feels about right for what you get. Burning of Prospero came with 47 miniatures, and a separate game, for the same price. So it does seem to be fairly standard – and of course, if you manage to get it for less, then go for it! With three ways to play the game, straightforward rules for the game, and an increasingly phenomenal miniatures catalogue with which to populate the game, Warhammer 40k has never seemed more exciting! Locally, 8th Edition seems to have garnered a lot of interest among the “never playing 40k” crowd, and while I’ve long been interested in the game, I’ve never been more keen to finally get some regular games in! Author spalanzPosted on June 20, 2017 June 19, 2017 Categories board games, WarhammerTags 8th Edition, game day, Games Workshop, Space Marines, Warhammer 40k2 Comments on There is only war!